Everything is Better with Bacon – Pao Says, "Open Wide!" One thing that we always have a ton of is chicken breast. It is the cheapest, easiest thing to eat. But eating the same chicken breast every night can get old pretty fast. Enter: Bacon. 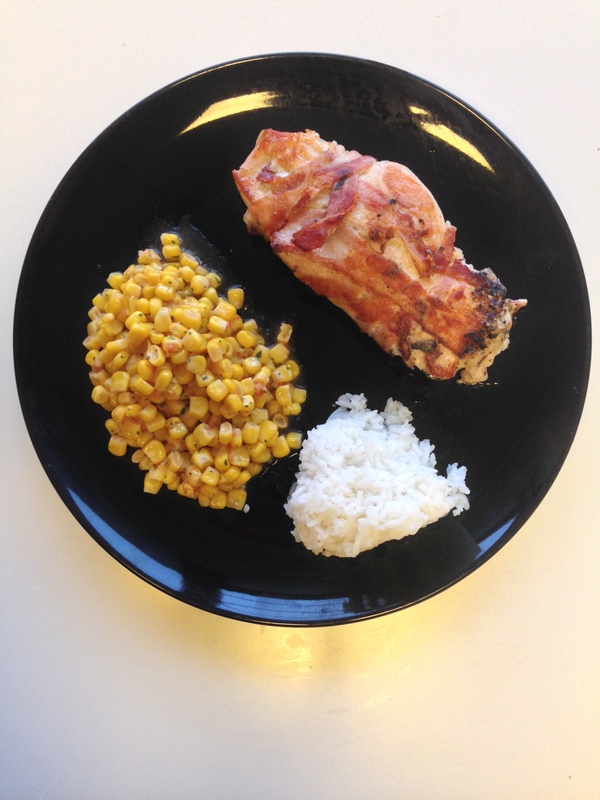 It may seem simple, but wrapping your chicken in bacon gives it loads of flavor and brings a new texture into the mix. I only use one slice per breast, so its not even something thats unhealthy. For the chicken, I sprinkle a small bit of salt and pepper over it, and then wrap it in bacon. It is important that you don’t over-salt it because the bacon has a lot of salt on its own. Once its wrapped, I let it sit for a few minutes so everything has a sec to settle in. On med-hi heat, cook your chicken! it should take about 4 minutes or so on each side, depending on the thickness of the breast. The “Fiesta Corn” is one of my favorite side dishes. In my “Taco Night” post, I explained how to make a quick and easy homemade salsa. I always have more salsa than chips, so I will take the leftovers and combine it with corn. I use canned corn as opposed to frozen corn because it always tastes fresher and more crisp (**note that for peas, however, I feel the opposite way). Toss a can of sweet corn into a pot to heat it up. Add a little pat of butter and a few spoonfuls of your salsa and its done. HOW EASY RIGHT?? In the pictured dish, I also made white rice. I have a rice-maker so it takes the guesswork out of it. Always make sure to salt your water and add olive oil before cooking the rice to ensure you don’t end up with some bland, steamed mush. Thats no good.